Your Challenge: Separate the different colors of ink in a sharpie marker using chromatography. 3. Fill a cup less than an inch high with half water, half isopropanol (rubbing alcohol). 4. Stand the coffee filter up inside the cup with the sharpie dots at the bottom almost touching the liquid. Watch as the ink runs up the paper. Try this with different kinds of markers that are the same color. Can you tell two different brands of black markers apart? Are some sharpie colors actually just combinations of other colors? But when light is combined we call it additive color mixing. By combing orange-red (R), green (G), and a blue or violet-blue (B) you can make white light. 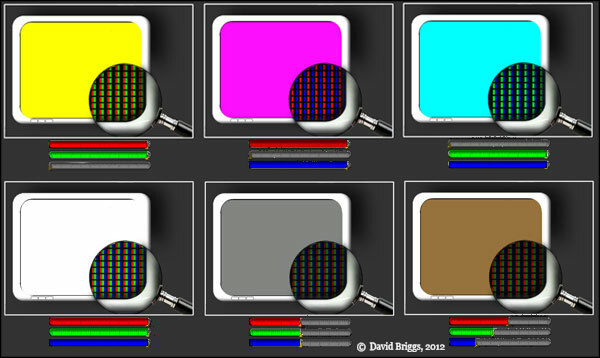 Did you know your computer and television screen can only make three different colors of light? The colors on your screen are formed by different combinations of these three main colors, RGB.